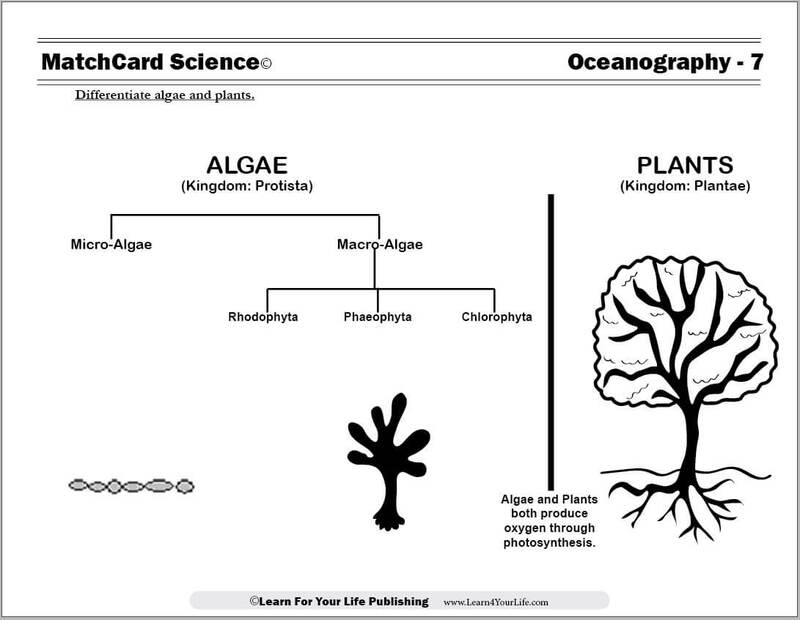 This Algae and Plants Worksheet is from MatchCard Science for grades 3 - 8. Students contrast micro-algae, macro-algae, and plants. Objective: Differentiate between algae and plants. MatchCard Information Pieces define and describe micro-algae, macro-algae, and plants. Ideas for projects are listed on the instructor's page and below. Algae Activities: Collect some algae, grow some algae, eat some algae, look for algae-based products in your home, soak in algae, and even have an algae party. 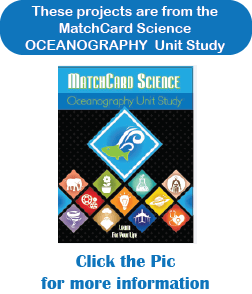 This is MatchCard #7 of the Oceanography Unit Study. 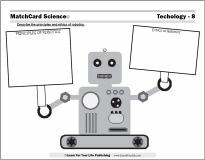 More information on the MatchCard Science curriculum is at the bottom of this page. How Are Algae and Plants the Same? Both plants and algae produce oxygen through the process of photosynthesis. With photosynthesis, carbon dioxide is converted into oxygen and glucose in the presence of sunlight. All types of algae and all plants produce atmospheric oxygen. Algae are plant-like organisms which are not plants. They are plankton which float on the surface of the ocean in the Euphotic Zone. The cells of algae have little or no differentiation. Differentiation refers to how different one type of cell is from another in the same organism. In animals, there is significant differentiation of cells. The cells of the heart are very different from the cells of the brain of that creature, even though all came from a single cell at the beginning of life. In algae, the cells are similar or exactly the same. In contrast, the cells of plants are differentiated in different parts of the plant. The algae are listed in the protista kingdom. Protista have eukaryotic cells, which means that within the cell membrane there are complex organelles (little organs) that carry out the function of the cells. Plants and animals also have eukarotic cells. Algae and other protista are different from plants and animals in that the cells have little differentiation between each other. All cells within the algae are very close to the same, even though the cells are complex. Micro-algae are the unicellular organisms that are frequently seen near the shore of oceans as well as in ponds and lakes. These one-celled algae have no differentiation. The cells may form long chains or clumps. Half of the oxygen in the air on this planet comes from micro-algae. In addition, the micro-algae form the base of the food chain in oceans and other bodies of water. Micro-algae contains the omega-3-fatty-acid which is an important nutrient. People who consume fish with this fish oil have a healthier diet than those who do not. The fish, however, get the oil from the algae. Algae supplements of omega-3-fatty-acids can be purchased and consumed. Macro-algae are known as seaweed. There are thousands of different species of seaweed on this planet. There is a Matchcard worksheek on the parts of seaweed. Macro-algae are multi-cellar organisms that range from several inches to several yards in height. They are benthos which are embedded to the ocean floor. There is a small amount of differentiation of the cells in the different parts of the seaweed. For instance, the cells of the floats are slightly different from the cells in the blades or holdfasts. The amount of differentiation is significantly less than would be seen in plants and animals. Learn more about the parts of seaweed. Algae do not fit well into the typical taxonomy systems of phylla and classes. While the main phylla of the three major types of seaweed are listed below, they do not fit exactly into the typical categories and sub-categories. 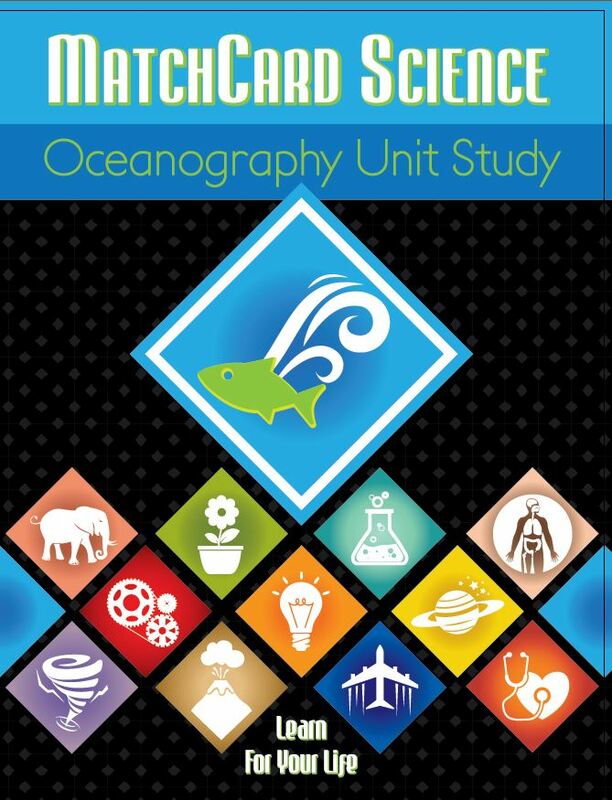 A student who desires to write a thesis on marine biology might find the classication of algae a challenging and interesting study. The average student, however, will find that algae is not a good example of taxonomy. Red seaweed is from the phylum Rhodophyta. Red Seaweed has a phycobilin pigment which gives it its reddish color. Chlorophyl is present, but masked by the phycobilin. Some species of red seaweed help build coral reefs. Some forms of red seaweed are consumed by humans. Brown seaweed is from the phylum Phaeophyta. The most popular form of brown seaweed is kelp. Kelp has been used since ancient times as a medicine and contains iodine and other nutrients. Underwater sea forests of kelp are havens to many types of fish and sea creatures. Green seaweed is from the phylum Chlorophyta. These are the most complex and well-differentiated of the seaweeds and the closest to plants. Green seaweed is found in salt water only. Plants are organisms from the kingdom plantae (or simply plants.) Plants include trees, grass, shrubs, mosses, flowers and bushes. Some taxonomy systems include green algae as a form of plant, but not red or brown algae. Take some photographs of the algae. Collect a small amount, and examine it under a microscope or with a magnifying class. Draw what you see. Notice the difference shapes of cells in the micro-algae. If you are unable to do a field trip to collect algae, do an internet search and print some different pictures of algae. Label them and make a collage. Take a photo or make a drawing weekly. You will need four to six weeks for this project. Check your kitchen cupboards, cosmetic drawer, and medicine supplies for items with ingredients made from algae. Look for agar, carrageenans, and alginates on their labels. Have a race. Make two teams, and see who can find the most products in 24 hours. Buy some agar to make homemade jelly. You can get it at large grocery stores, health food stores, or even amazon.com. The recipe will differ depending on which product you purchase. Follow their recipe for making jelly or gelatin. You may also like to make sushi from seaweed. How would you like to soak in a bath of algae? Sound disgusting? Spas pay a lot of money for seaweed baths. The same ingredients that provide the gel like texture to soft foods can soften your skin. You can get your own seaweed, rinse it in the kitchen sink, then add it to warm water in a bath tub. If that sounds a little too primitive for your tastes, consider buying dried seaweed to add to your bath. How about giving Grandma a basket of algae for Mother's Day? It might sound gross, but a basket of seaweed salts for a bath, hand lotion made of carrageenans, and sauces and treats from other sources of algae might be more luxurious than it sounds at first. You can tie a bouquet of seaweed around the basket with a bow. Or how about having an algae birthday theme instead of super-hero or princess or other popular themes? Algae invitiation; algae plates; algae on the cake. Okay, maybe that's pushing it a little bit. But without algae, there would be no ice cream.